Water Demineralization System in Central Puerto power plant. A power plant in Buenos Aires needed to increase its demineralized water production and save money on operating expenses, but the poor quality of the available raw water from a nearby river made it difficult to make the switch from ion exchange technology to reverse osmosis (RO). 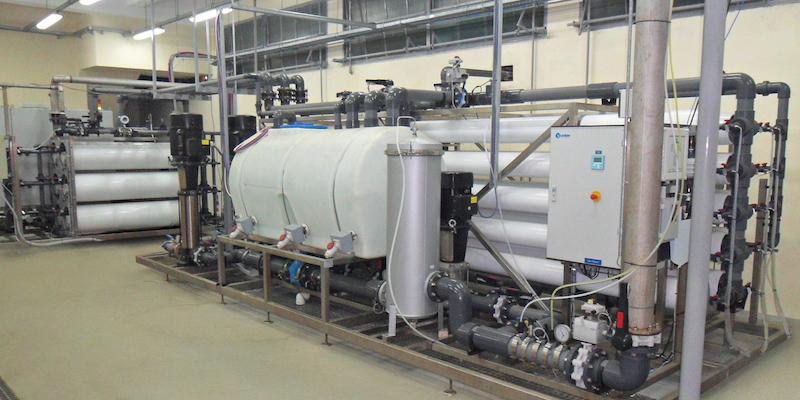 This case study shows how Fluence installed a reliable ultrafiltration-reverse osmosis-CEDI system to produce demineralized water while reducing the plant’s overall operating expenses. The Central Puerto power plant in Buenos Aires, Argentina, needed to increase production of demineralized water for use in its high-pressure boilers, while lowering operating costs. The company’s goal was to replace its current ion exchange demineralization process with RO and save on regeneration costs. But, the poor quality of the plant’s feed water was such that the RO membranes would have been subject to mineral fouling rapidly. Following a detailed analysis of the raw water quality, Fluence concluded that using ultrafiltration to pretreat river water would solve fouling problems and make RO an effective option. Central Puerto gets its feed water from the Río de la Plata River. Sampling and lab analysis showed that biochemical oxygen demand (BOD) and total organic carbon (TOC) levels were higher than usual, and that achieving suitable water quality for boiler feed applications (less than 10 ppb of silica) required significant pretreatment. Clarification was tested but the silt density index (SDI) of the clarified water remained very high. As a result, it was clear that conventional pretreatment with sand filters would not prevent membrane fouling. Fluence supplied Central Puerto with a complete demineralized water plant using membrane technologies. Following an initial pretreatment, feed water was pumped through an ultrafiltration system. The ultrafiltration stage produces water with SDI levels lower than 3 which are perfectly suitable to feed the RO system. The treated water is then stored in a tank for the UF membranes backwashing and for feeding the reverse osmosis system. Following the ultrafiltration stage, the pH is raised with sodium hydroxide injection to improve carbon dioxide removal before the RO treatment stage. Finally, the permeate is sent to the continuous electrodeionization system (CEDI) for final polishing. This process eliminates the need for a holding tank to prevent carbon dioxide contamination. CEDI technology relies on ion exchange resins and ion-selective membranes for additional filtration, and doesn’t require costly chemicals for resin regeneration. Because of high fouling potential when using river water, reverse osmosis is rarely a choice for surface water demineralization. Adding ultrafiltration as pretreatment provides a viable solution to address the risk of fouling. Fluence made it possible to use RO technology to produce demineralized water at Central Puerto power plant. No shutdown was necessary due the fact that the existing ion exchange plant remained in service throughout the construction. The switch to RO and CEDI has greatly reduced the regeneration costs of the existing resin system. Contact Fluence to learn more about our industrial water solutions, or discuss your specific project details with our experts.